Even though we’re not huge sports fans we often use game day as a perfect excuse to have some friends over and enjoy some good company and good food while we watch the game. As you probably know by now I absolutely love serving a variety of appetizers so I can enjoy several different bites of goodness but I’m always looking to try new and fun dishes. That’s how I came up with this candied bacon footballs recipe. 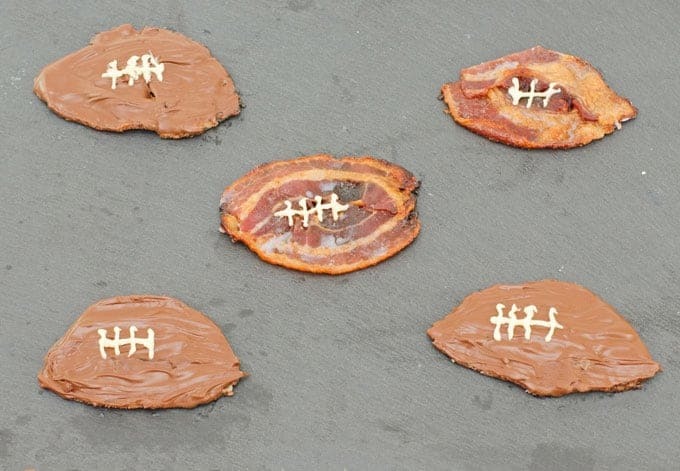 Footballs are often called pigskins, so I thought it would be pretty clever to make some pig (skin) candy to enjoy on game day. Making candy may sound intimidating but this is quite possibly the easiest recipe ever with just some Wright® Brand Bacon, brown sugar, and a bit of chocolate if you like. Like most, I’ve loved bacon all my life and grew up eating the regular thin bacon. In fact, I didn’t even realize the gloriousness that is thick bacon existed until I was an adult. Now I won’t eat any other cut of bacon. Since the bacon is front and center in this candied bacon recipe it’s pretty important to use a good quality bacon. 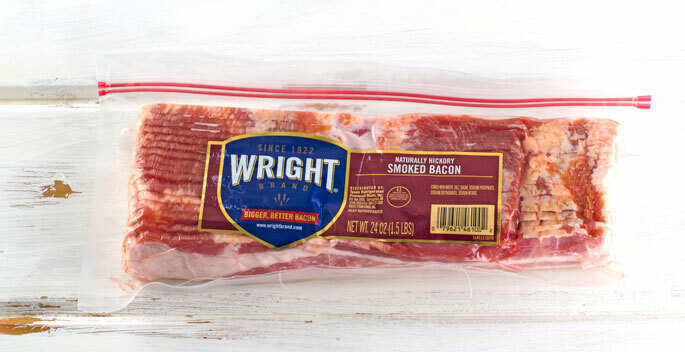 One of my favorite brands of bacon to use is Wright Brand Bacon. I love that Wright Brand has consistently thick and hearty bacon that has a great smoky flavor that isn’t too strong. 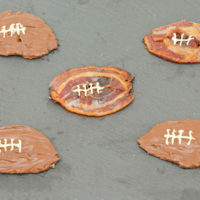 As such, Wright Brand Bacon is perfect to use when making these candied bacon footballs. 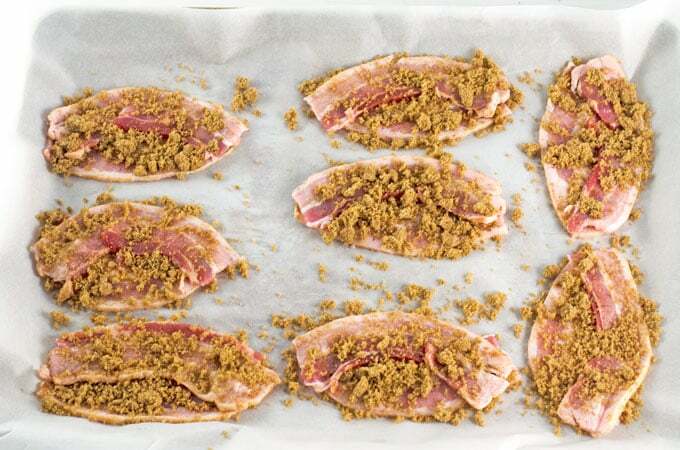 I make mine with the super simple ingredients of bacon and brown sugar but you can also change things up a bit by adding a bit of spice and sprinkle on some ground black pepper or cayenne. At some point I want to try adding some sriracha, too. While you can serve the bacon just candied, I like to take it to the next level and add a bit of chocolate to help them look a bit more football-like. You can simply pipe on some white chocolate for the football stitches but for the true chocolate lovers like myself, I like to dip one side of the candied footballs into milk or semi-sweet chocolate and then pipe on the stitches. Such a delicious sweet and savory treat. The bacon treats pair really well with just about any usual game day snacks like chips, sandwiches, etc. I like to keep things really simple and pair them with some Tyson® Any’tizers® Snacks with homemade dips and Ball Park® Hot Dogs sliced into bite-sized pieces and wrapped with a strip of puff pastry and baked to golden deliciousness and easily enough to feed a crowd. I always buy Tyson Foods products at my favorite local Kroger grocery store because I know they’ll be well made and delicious, saving me time so I can spend time with my guests Homegating instead of kitchengating. I have made these several times now and here are a few tips to make these treats extra easy. First of all, use the bacon straight out of the fridge. Cold bacon will shrink less during cooking. Next, I recommend folding the bacon in half and then cutting along the fold to make sure you have 2 equally long slices of bacon. Then, slightly curve the bacon on the baking sheet and make sure the ends are on top of each other. I will usually add a pinch of brown sugar or a chocolate chip between the ends to make sure they stick together well. I’ve discovered that adding another piece of parchment paper on top of the brown sugar covered bacon and then another pan on top of the paper really helps to make sure the bacon stays flat and sticks together. The “caramel” left on the baking sheet after cooking also makes a pretty awesome treat for the cook. I would say that one football per person would be plenty but people are constantly going back to the tabletop tailgate for this favorite. Luckily, these can be made earlier in the day and kept in the fridge. 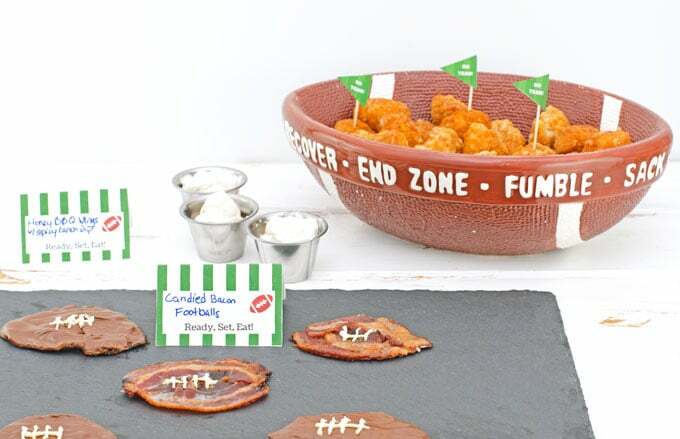 Here’s how to put this Homegating snack hack together. 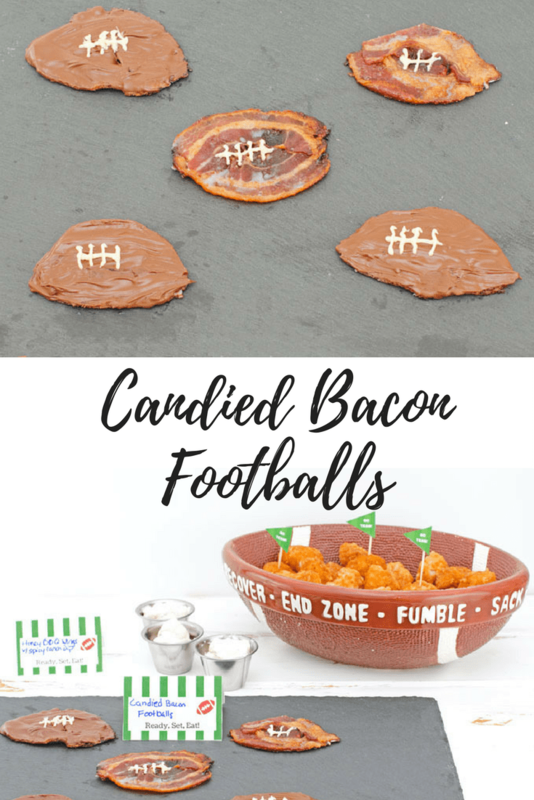 This candied bacon footballs recipe makes a fun play on pigskin to serve as a sweet and savory treat on game day. Line a baking sheet (with raised edge) with parchment paper or non-stick sprayed foil. 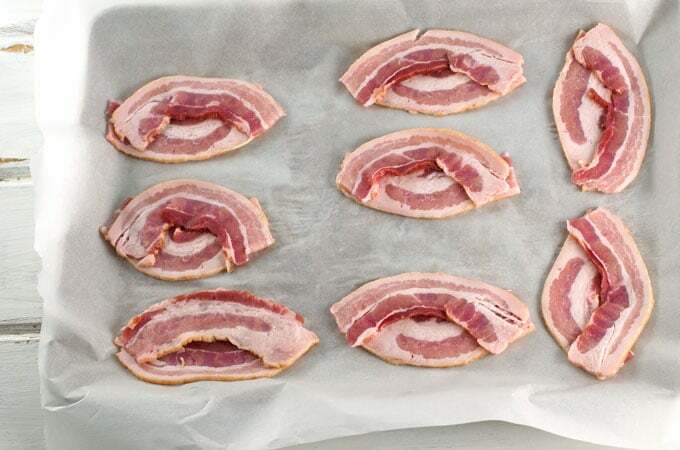 Cut each slice of bacon in half. I do so by stacking all the slices and folding them in half and cutting along the fold to make sure they are all the same length. Try to stretch the bacon as little as possible. Place one half slice of bacon on the baking sheet, slightly curving it to look like half of a football. Place another half slice to make the other half of the football, making sure to overlap the ends and press the centers together to be just touching. Generously sprinkle the footballs with brown sugar and any desired spices and lightly press into the bacon. Put another layer of parchment paper or non-stick sprayed foil on top of the footballs and then place another baking sheet on top, firmly pressing it down. 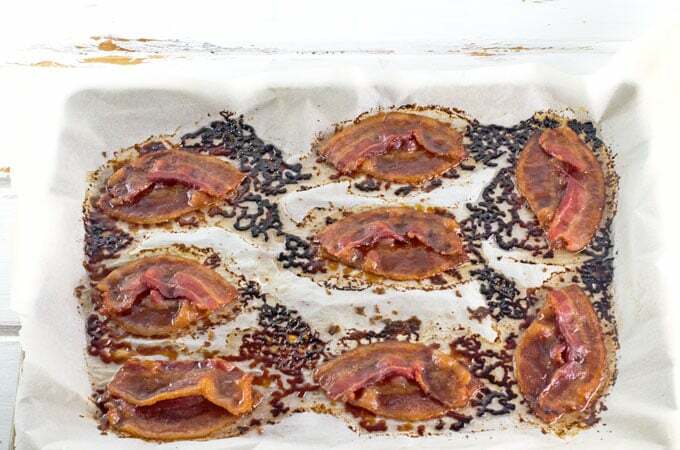 Bake in preheated oven for 15 minutes then check for crispness by removing the top pan and paper or foil, keeping in mind the bacon will crisp up a bit more as it cools. If not crisp enough, check every 2 - 3 minutes until cooked as desired. You don't need to put the paper or foil and pan back on. Let cool completely and then decorate to look like footballs. If your footballs are a bit misshapen you can use a knife or, my favorite, kitchen shears to clean them up. Allow chocolate to harden before serving.